I don’t know why I am on such a Southwesty or Mexican-style cooking kick lately, but I am enjoying it! I love the flavors of all the smoky cumin and chili powder. The spicy kick of it all. 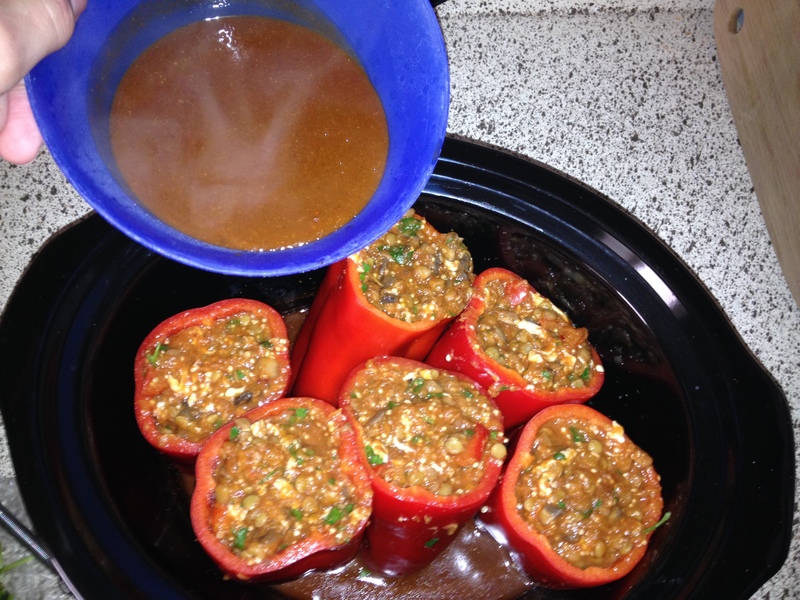 I decided to make stuffed peppers again, since the last time was over a year ago – can you believe that? Over a year for a stuffed pepper? What is wrong with me? Sheesh. 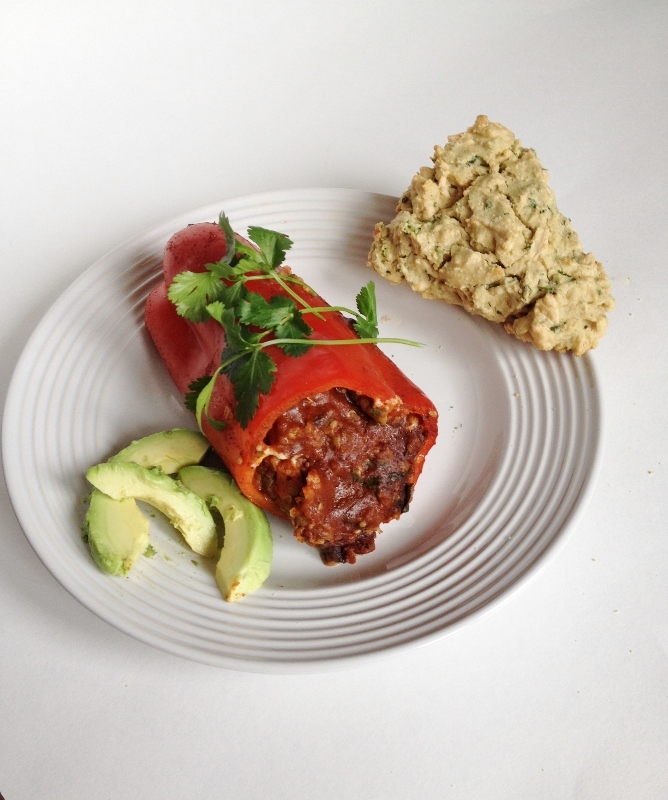 These Crockpot Enchilada Stuffed Peppers are vegan, gluten-free and have a hidden veggie in them…keep reading! And, if that doesn’t beat all, I even went the extra distance and made Savory Cheddar Scones with cilantro and jalapeno. It has been over a year since the last stuffed pepper I made, so it was time to stuff something! And make it a little different this time (the last one was more taco-ish) and since I am loving cumin and chili powder right now I knew enchilada sauce was in order. I don’t know why I have been in a spicy mood, but at least I am getting my metabolism a little rev. Also, these make a lot so either buy a lot of peppers, freeze the leftovers, or enjoy it for dinner with some rice. Yum. So for these peppers I tried to think of something different to stuff in them. No soy meat this time, I decided to use quinoa and lentils – both of which I had bought in the bulk section of the grocery store. The other new thing I added…butternut squash! I had almost 2 1/2 cups left over from the brownies which I had frozen and needed to use up. I of course added my all-time favorite veggie, mushrooms. The mushrooms and lentils were the meaty texture that you look for in enchiladas. Other than that not a lot going on in these peppers. Let start with saying the my kitchen light burnt out Friday afternoon and was not replaced until late afternoon Sunday…so the pics are a little dark, especially of the crockpot. 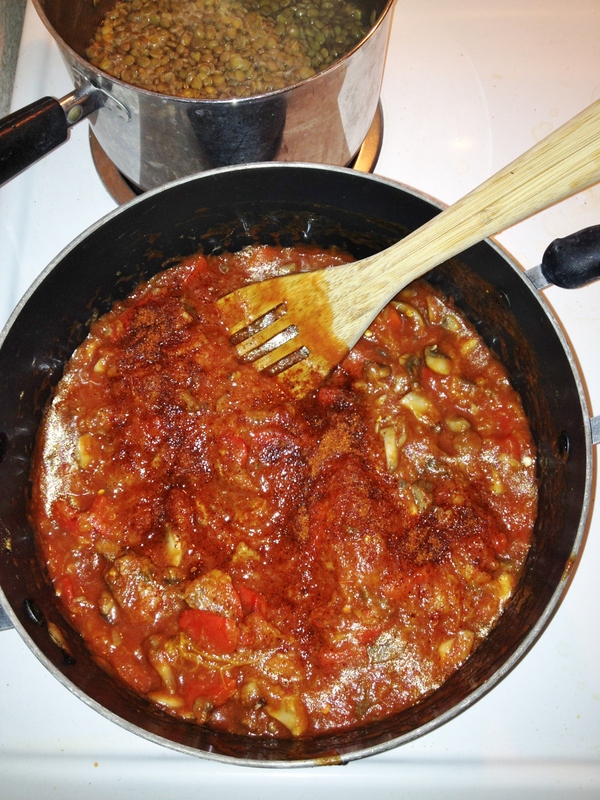 First make the enchilada sauce, recipe found here, in a small pot on the stove. Get the crockpot on high with the lid to get it hot. Cook the sauce until just coming together then pour into the crockpot, lid on. Whisk every so often while cooking stuffing. 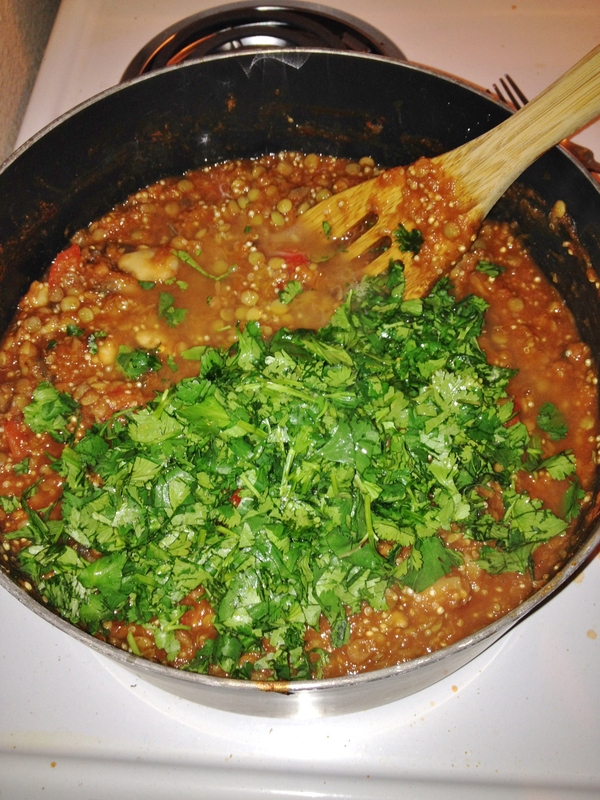 In the same pot as the sauce was made in add water and lentils and bring to a boil while cooking veggies. 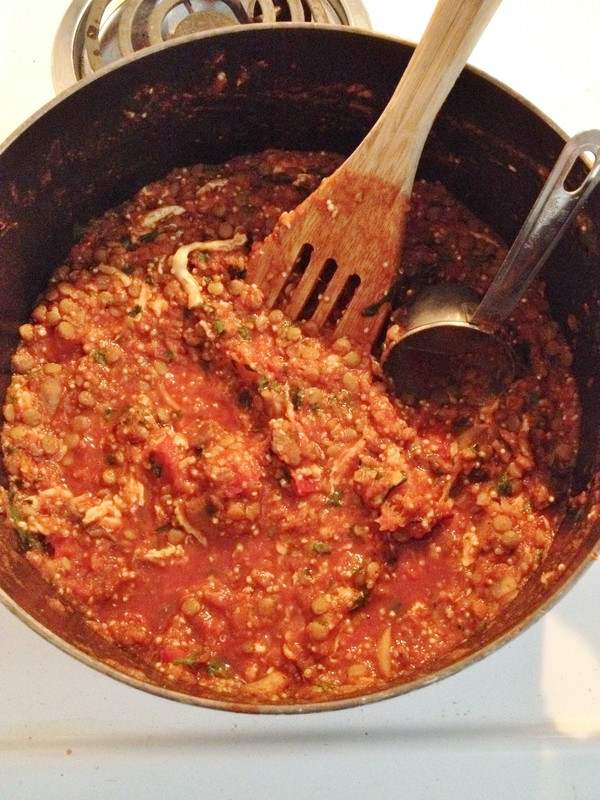 In a large pot pour a tablespoon of olive oil then toss in chopped mushrooms and red onion. Cut tops off peppers and break pieces of peppers off and toss with mushrooms and red onion. 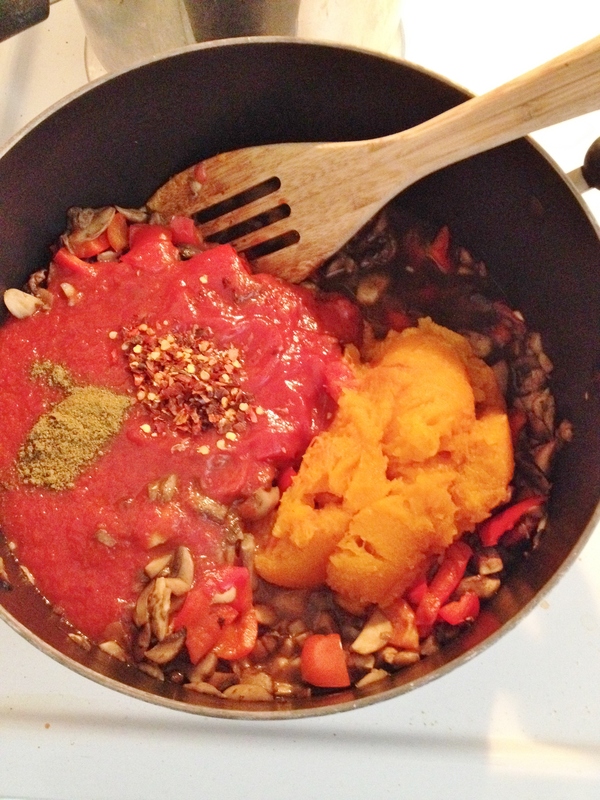 Saute until veggies are soft then add tomato sauce, spices, and butternut squash. Mix and turn heat up to get everything grooving together. 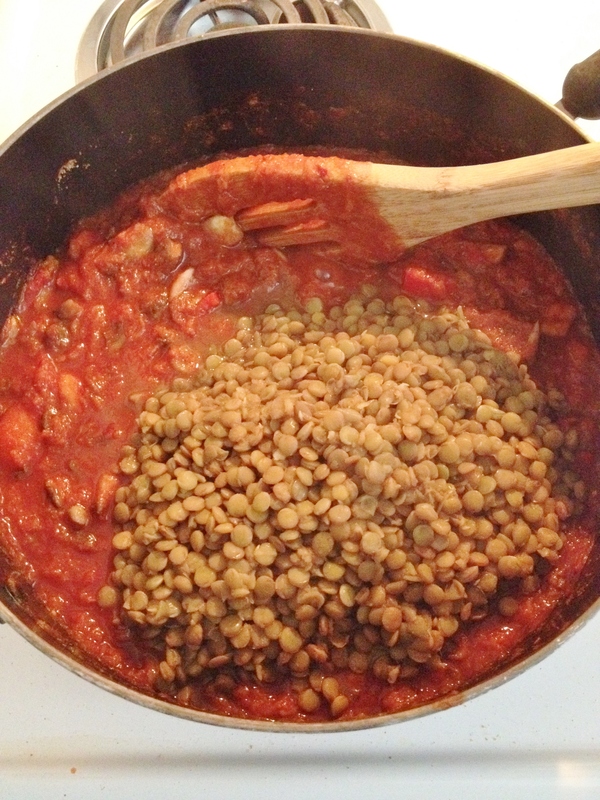 Once lentils are done add them to the pot and mix. 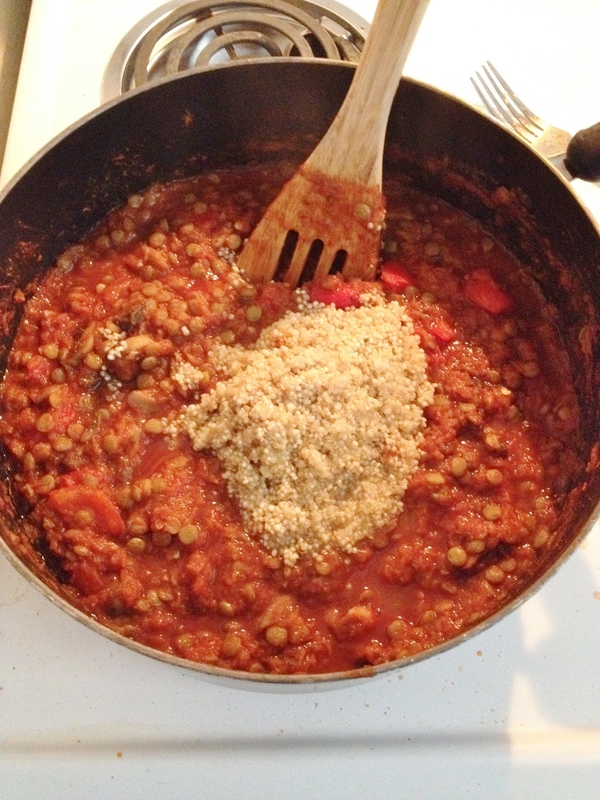 Wash smaller pot out then add water and quinoa. Cook until water is just evaporated then add to stuffing (it does not have to be cooked through, since it will cook in the crockpot). Mix well then add chopped cilantro and lime then mix again. Add half the bag of Daiya pepperjack cheese and mix. Stuff the peppers – I actually measured it this time, and it is a 1/2 cup for the smaller peppers and 3/4 cup for taller / bigger ones. Take out about a cup of the sauce from the crockpot. 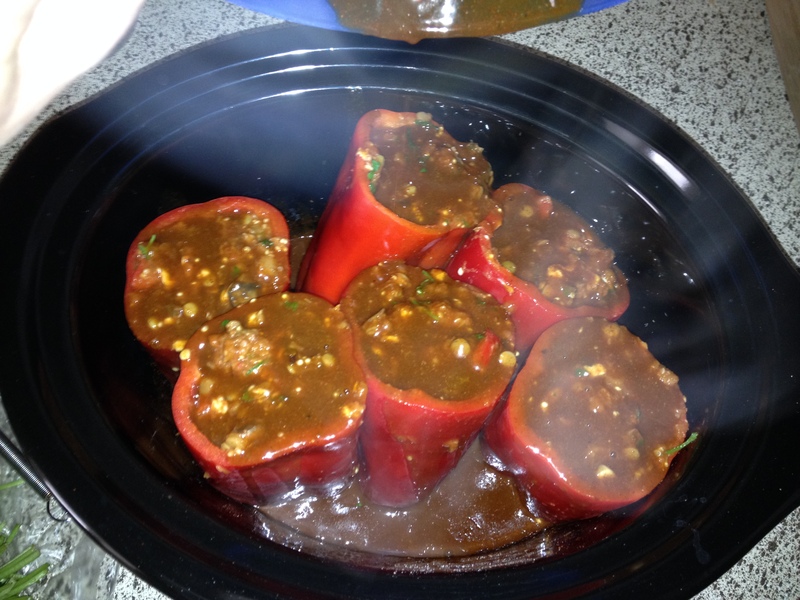 Carefully place peppers into crockpot and wiggle into the sauce. Pour the sauce over the peppers. Cover the pot and let bake two hours. The squash was amazing in this. It didn’t give it any distinctive flavor, but added a depth of flavor that would have made people wonder what flavoring you used. So good. 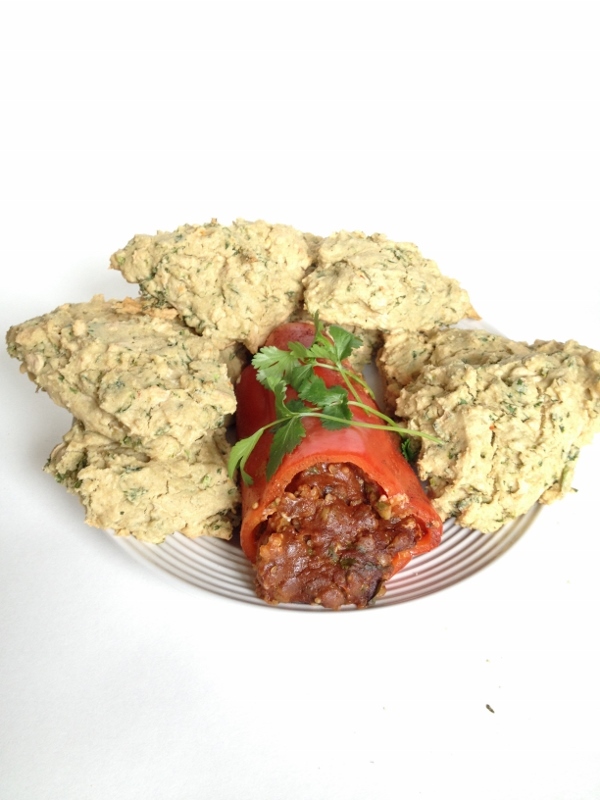 About 30 minutes before the end of the peppers cooking, turn oven to 425 degrees. 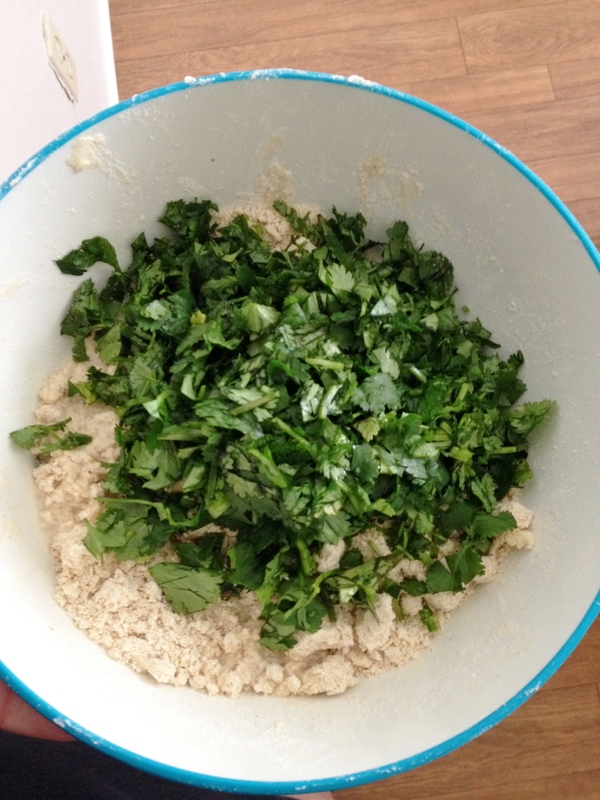 Pour dry and wet ingredients, along with the lime juice and cilantro and mix. Add the rest of the cheese and fold in. Don’t over mix. 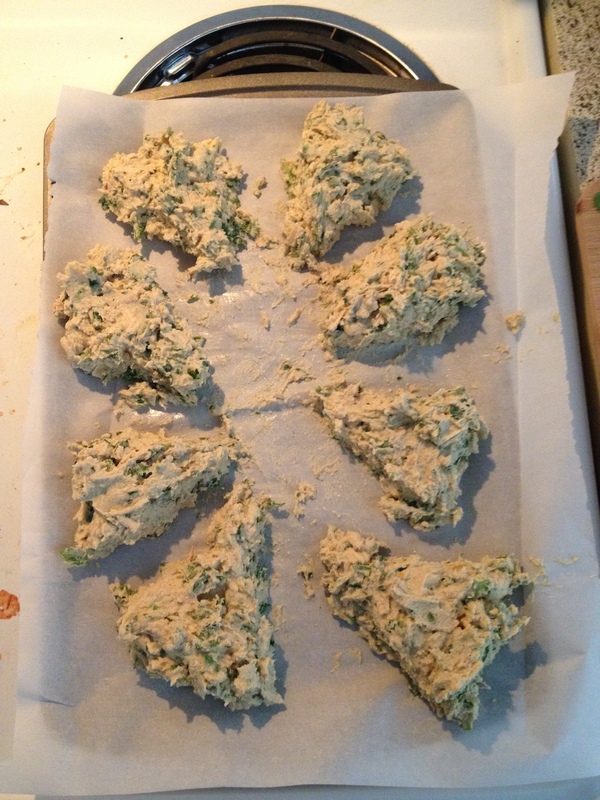 Lay parchment paper down on baking sheet, pour dough and form into a circle. 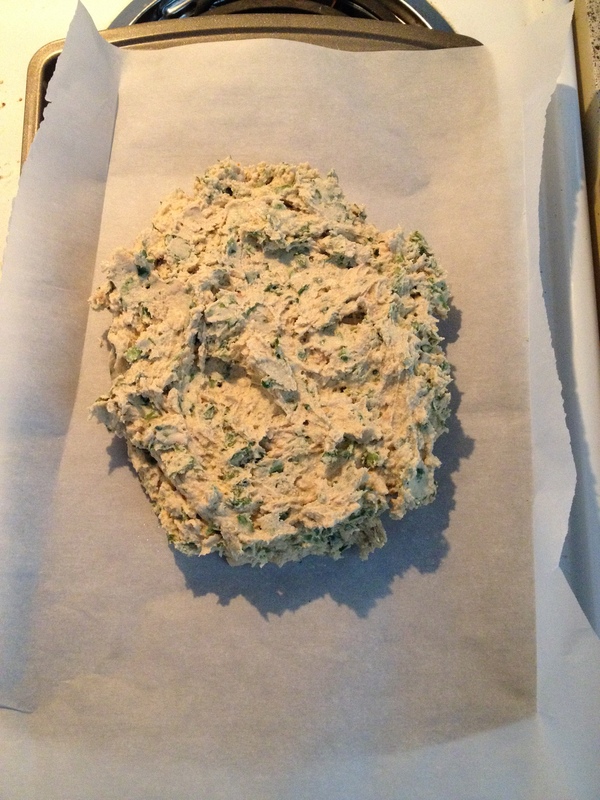 Carefully cut into 1/8ths and spread out to give room to bake. Bake for about 23 minutes. Because of the cheese and extra milk it takes longer than normal scones; you can keep baking them until browner but only if the bottoms are not burning. 1. Turn crockpot to high with lid on. 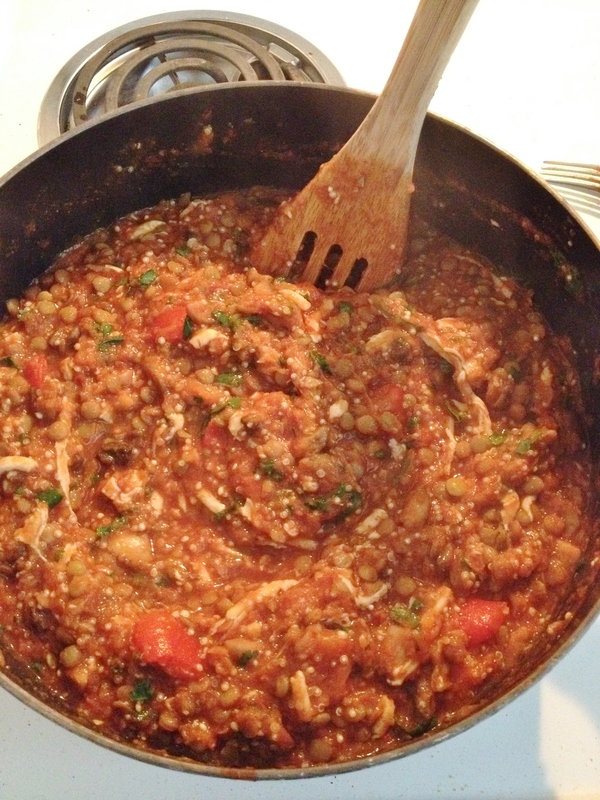 Make enchilada sauce in small pot on stove. Once it starts to thicken pour carefully into crockpot and cover with lid. Whisk every so often. 2. Wash out pot then add water and lentils. Boil two minutes simmer 30 minutes. 3. In large pot pour one tablespoon olive oil. Dump mushrooms onto cutting board and run knife through. Add to pot and turn on medium high. Chop onion and add. 4. 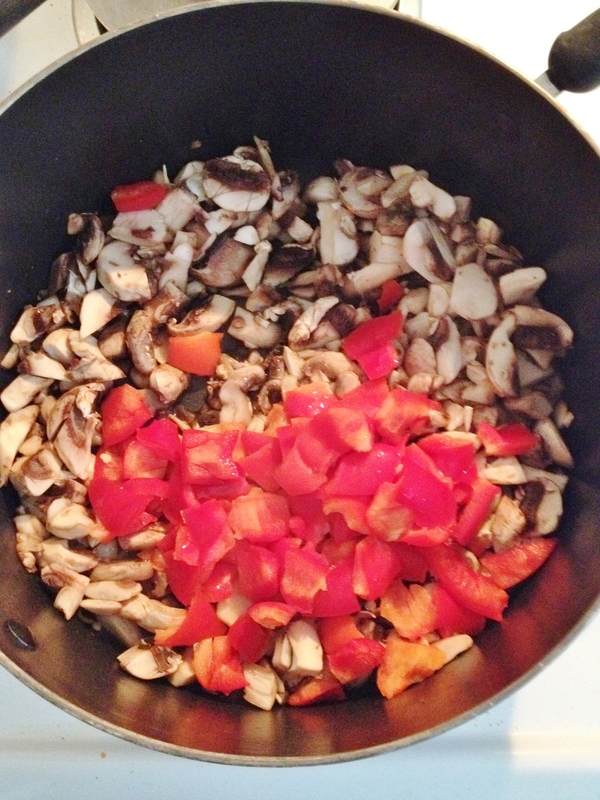 Cut tops off peppers and tear off leftover pepper pieces from tops and add to mushrooms. Cook until soft. 5. Add butternut squash, tomatoes, and all spices. Mix carefully and cook. 6. 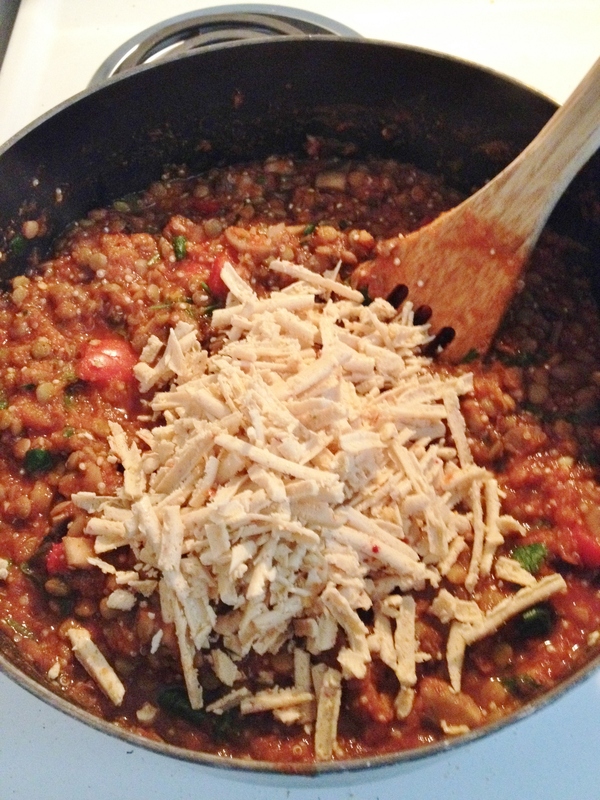 Add lentils to pot and stir. Clean out peppers. 7. Wash out small pot then add quinoa and water. Cook until water is gone then pour quinoa into pot. 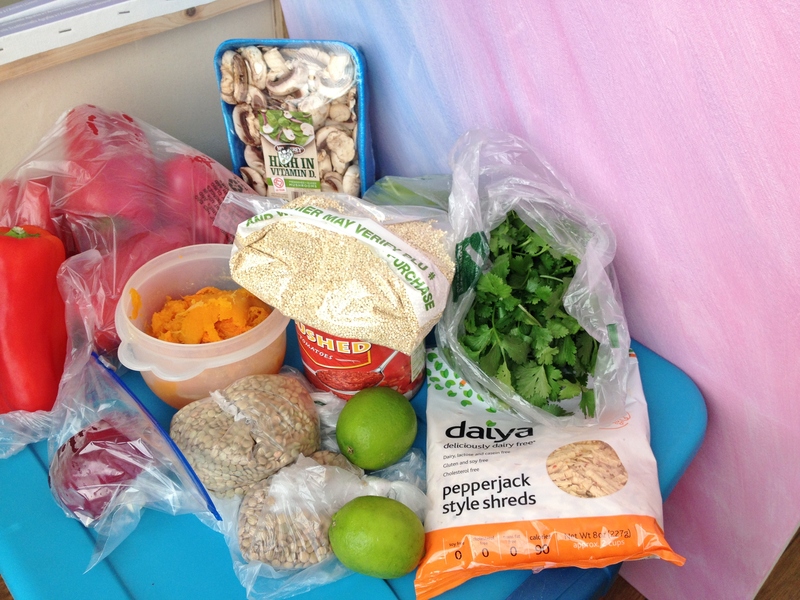 *The quinoa will continue to cook in the stuffing. 8. Mix everything really well. 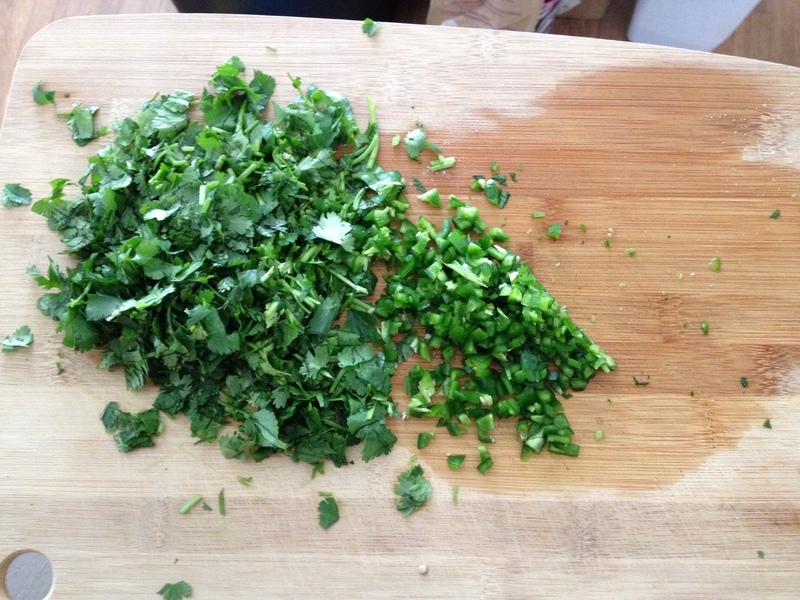 Add lime juice and half of the bunch of cilantro, chopped. 9. 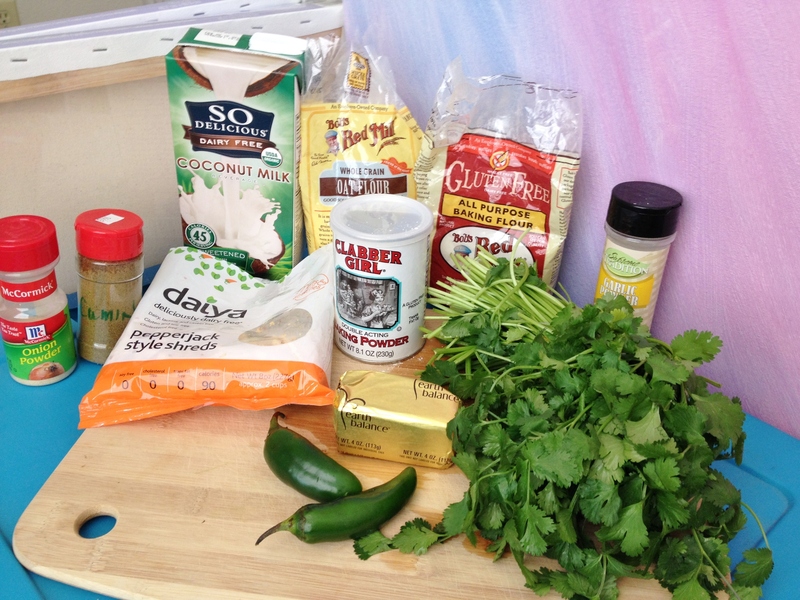 Take out about 1/2 – 1 cup enchilada sauce and reserve. 10. 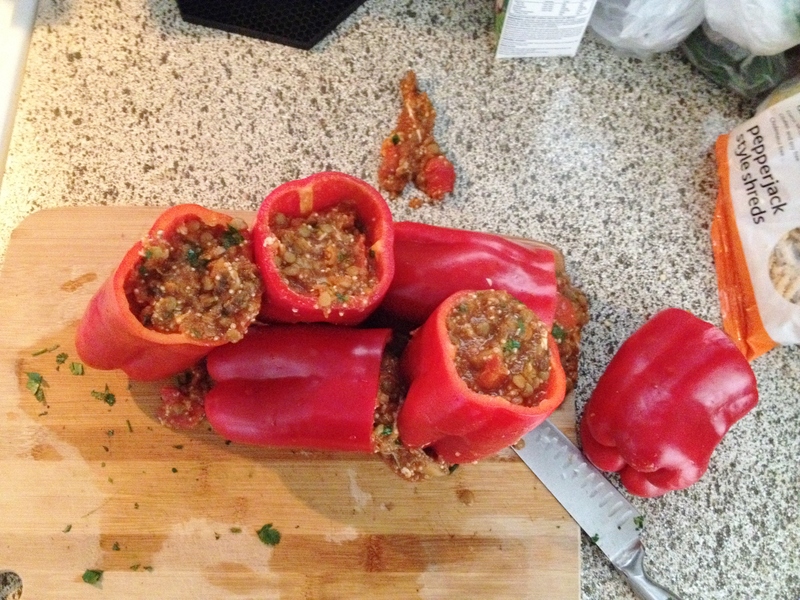 Using a 1/4 measuring cup scoop stuffing into peppers. Gently tap peppers on counter to settle stuffing. 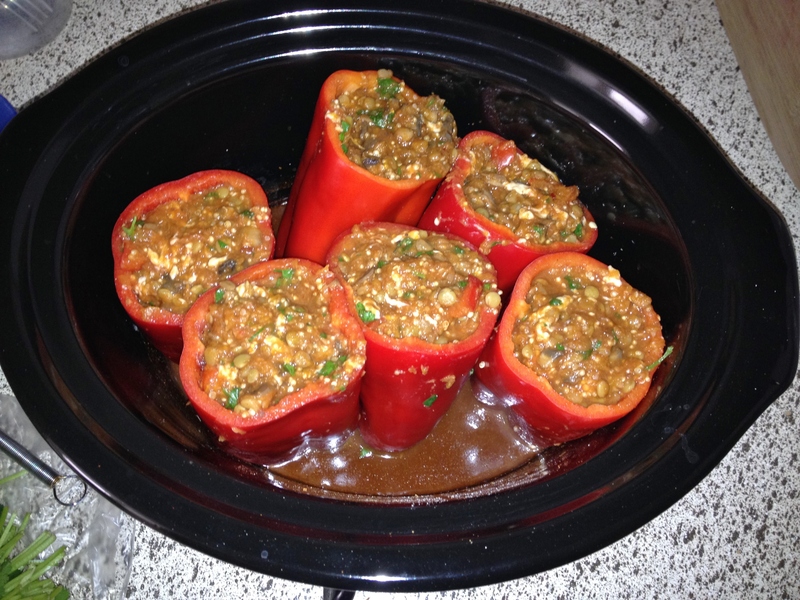 Put peppers into crockpot as stuffed. 11. Pour reserved sauce over tops of peppers. Put lid on crockpot and cook two hours. 12. You will have about 3 1/2 cups left over stuffing. 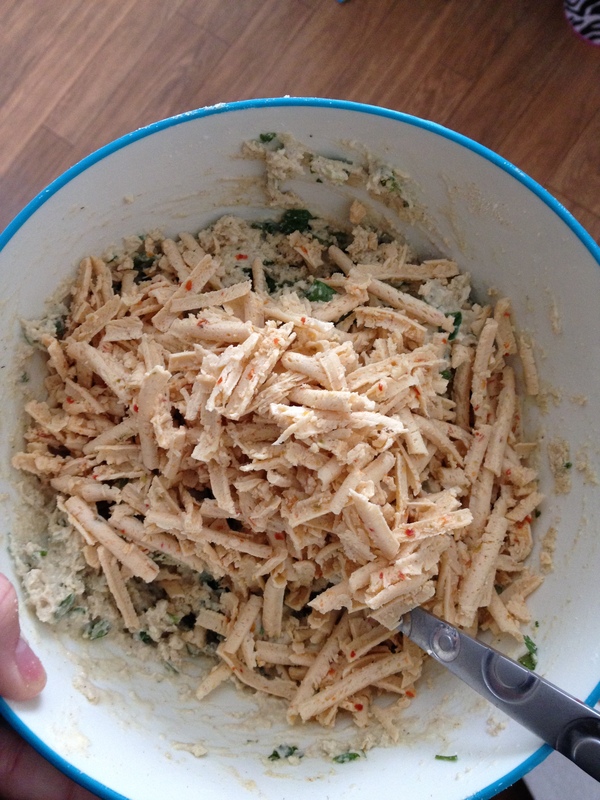 Freeze it, add more to your portions, have it for dinners with some cooked rice. 1. Turn oven to 425 degrees. 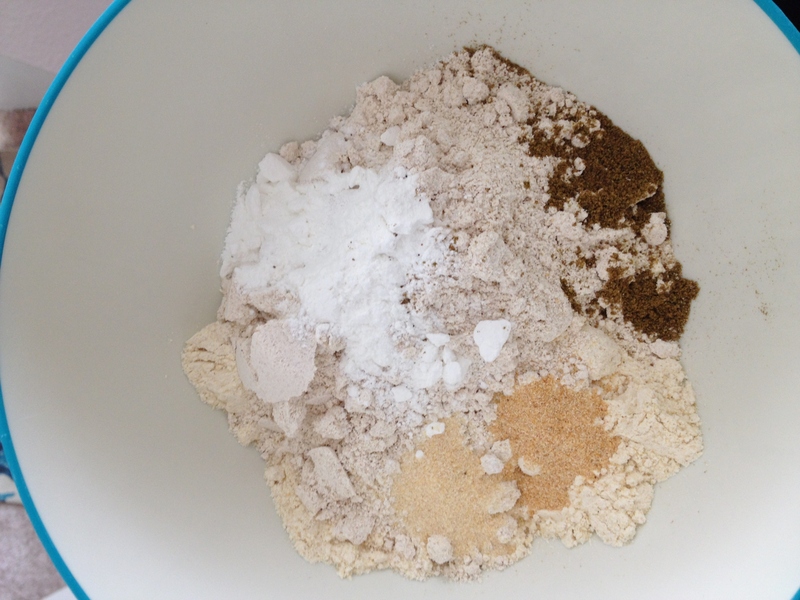 In medium bowl add flours, baking powder, spices, and milk. Mix well. 2. 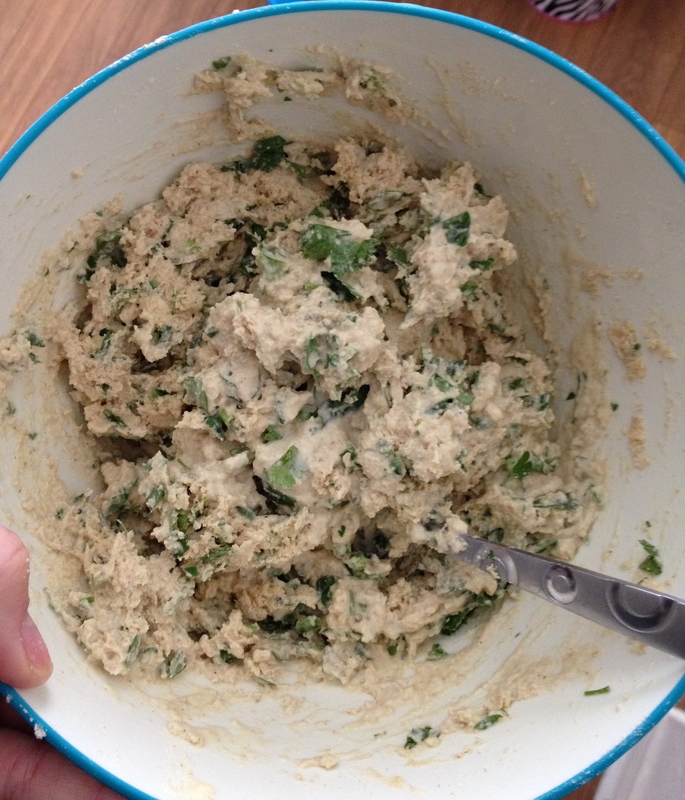 Add chopped jalapeno and cilantro. Mix. Fold in cheese. 3. Line baking sheet with parchment paper then dump batter onto paper. 4. Form into an even round, cut into 8ths. Spread, as carefully as possible, each triangle away from the others. 5. Bake for 23 minutes. 6. Eat warm (not piping hot) and enjoy!